Energy development in the Colorado River basin is mostly derived from the burning of fossil fuels and particularly at coal-fired generation stations located in rural communities. There is one nuclear power plant near Phoenix, AZ and another has been proposed near the city of Green River in eastern Utah. Ironically, because this desert landscape has so much sunshine, roof-top solar power generation is negligible, in comparison. Uses of this power is dedicated to mechanically lift Colorado River water to higher elevations for consumption by industrial agriculture and ever-expanding municipalities. The Colorado River basin has some of the coldest (Gunnison, CO) and the hottest temperatures (Yuma, AZ) in the United States, and climate control in homes and buildings is the dominant use of this energy consumption. Unfortunately, the development of energy resources from oil shale (kerogen) and tar sands (bitumen) is currently under consideration (mostly in eastern Utah and western Colorado) and if these dirty fuels are fully exploited, the Colorado River's water will be seriously challenged both in quantity and in quality. This form of energy development was promulgated by the 2005 Energy Policy Act, which is probably the most damaging legislation to air, water and land resources ever devised. Here is the voting roster of this legislation. 2005 - Energy Policy Act. Wikipedia. 2007- Energy Independence and Security Act. Wikipedia. 2001 - Brittle Power: Energy Strategy for National Security. Lovins. 1977 - Report of Western Energy Expansion Study. Reclamation. 2016 - The Impact of the Loss of Electric Generation at Glen Canyon Dam. GCI. 2009 - Glen Canyon Releases: Economic Considerations. David Marcus. 2006 - Can Reservoir Storage Be Uneconomically Large? Booker & ONeill. 1999 - Lake Powell Preliminary SocioEconomic Impact Analysis. Jones. 1981 - Utilization and Impacts of Climate Information on Development Operations of the Colorado River. Howe & Murphy. 1960 - Audit of CRSP. Government Accountibility Office. 1997 - CRSP hydropower under environmental constraints. Bureau of Reclamation. 1996 - Modeling Hourly Operations at Glen Canyon Dam. Reclamation. 2010 - Post 1996 Glen Canyon Dam ROD economic analysis. Argonne Lab. 1996 - The Colorado River Workshop. Grand Canyon Trust. 2003 - What Every Westerner Should Know About Energy. Limerick. 2008 - Energy Down the Drain. National Resource Defense Council. 2008 - Power Plants: Characteristics & Costs. CRS. 2009 - Oil Shale Report. University of Colorado at Boulder. 2009 - America's Biggest Polluters: Carbon Dioxide Emmissions from Power Plants in 2007. Arizona Environment. 2009 - Hydropower study of Glen Canyon Dam by David Marcus. Table 1. Tables 2 and 3. 2009 - Evaluating the Feasibility of a Large-Scale Wind, Water, and Sun Energy Infrastructure. Jacobson & Delucchi. 2010 - Lifeline: How climate and clean energy can safeguard water. WRA & EDF. 2010 - Ripple Effect: Water Risk in the Municipal Bond Market. Ceres. 2010 - Hydropower Resource Assessment. USBR. 2011 - Every Drop Counts. WRA. 2011 - Energy's Water Demand: Trends, Vulnerabilities, and Management. Congressional Research Service. 2011- The Water/Energy Nexus: Western States Projections to 2100. SEI. 2011 - Nuclear Power: still not viable without subsidies. UCS. 2014 - Energy Water Nexus: Energy Sectors Water Use. CRS. 2014 - Energy Water Nexus: Water Sectors Energy Use. CRS. 2012 - Dangers of living near nuclear facilities. NAS. Document archive. Western Resource Advocates. 1953 - Depletion of water supplies allocated to state of Colorado by Colorado River Compacts. Hill. Colorado Water Conservation Board. Note: Includes discussion of oil shale development. 2009 - Colorado University at Boulder Report. 2010 - CERES Report on Oil Shale/Water Nexus. Click here to visit home page of Uranium Watch. 2005 - A Technical Report Toward Reclaiming Uranium Mill Tailings. Dohrenwend and Greenbaum. 2008 - Uranium Mining. Southwest Hydrology. 2010 - Characterization of Breccia Pipe Uranium Deposits in Northern Arizona. USGS. 2010 - Statement of Klee Benally of Indigenous Action Media. 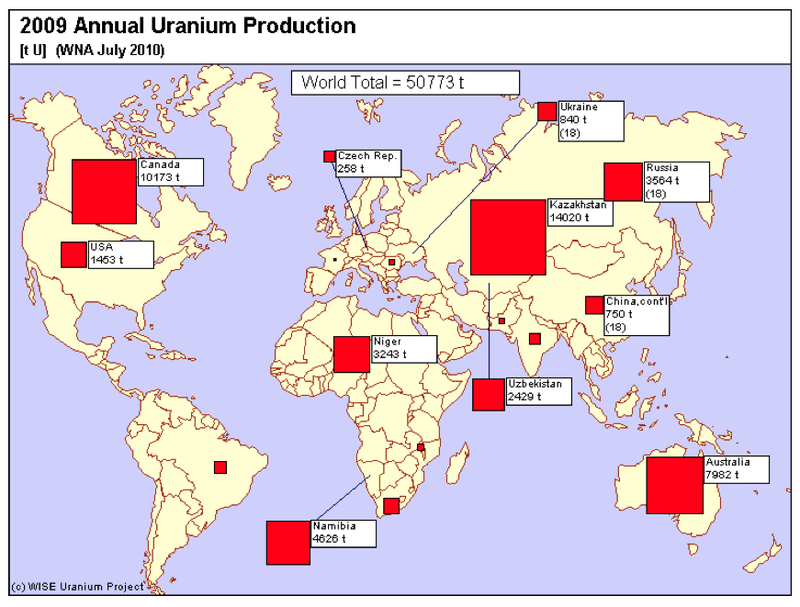 Uranium production worldwide in 2009. Graphic. Uranium claims in Grand Canyon watershed. Graphic. 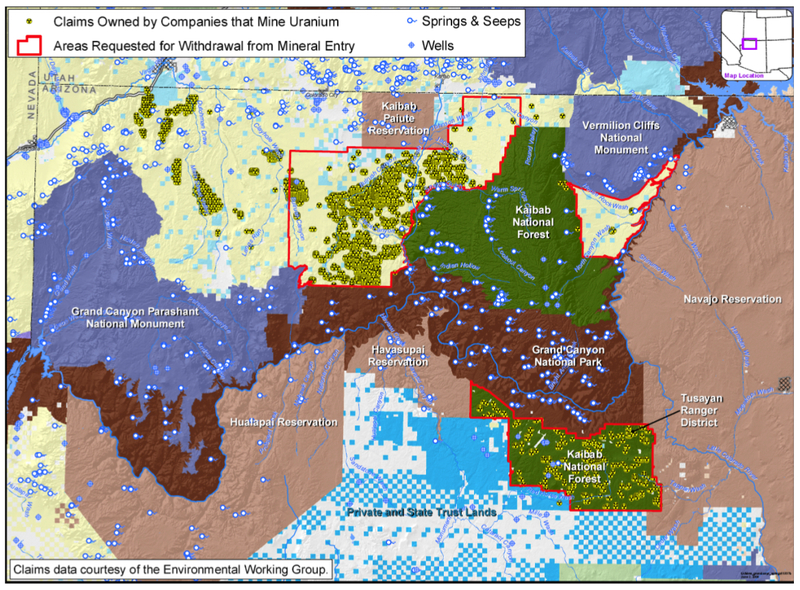 2012 - Chronology of the 20-year withdrawal of Grand Canyon uranium claims. Grand Canyon Trust.